mussop, thunderkyss, KA4Texan and 2 others like this. "Forced" might be the wrong word. Perhaps "encouraged?" The link you offer is a fluff piece though. I don't expect them to say "we got a new DC because he was forced on me." Dont think we'll ever see a Hc say that. Exactly & the word "encouraged" is probably putting it too lightly. Kubiak was indirectly forced due to the failure he'd experienced the 4-5 years prior with his handpicked guys in Smith & Bush and his overall team failings in getting us to the playoffs. 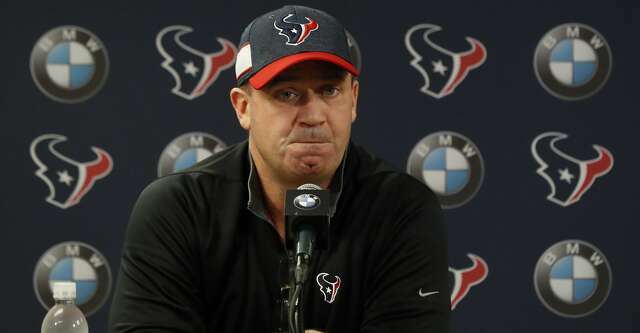 McNair probably made the "suggestion" to Kubiak about bringing in Wade with that Samuel L. Jackson "I dare you" look on his face..
CWTexansFan, OptimisticTexan, KA4Texan and 3 others like this. Buttchin.... nah nah nah nah nah nah nah nah... BUTTCHIN!!! Sad that I can actually see OB showing up on game day the same way. TheKDog, Texansballer74 and Max like this. I wonder if we can get someone to hold up a sign like on Big Bang Theory so we know when its corporate speak and when it truth. thunderkyss, steelbtexan, CWTexansFan and 1 other person like this. When you're giving up ridiculous scores on STs, because you aren't even covering a whole side of the field.. that's coaching. Then throw in all the dumbass Challenges and crappy clock management. (As well as playoff record). He's not been a very good coach up to this point. Special teams was an area of strength most of last season. It had been piss poor for most of the teams existence but pointing to special teams hardly paints an ugly picture of our team as a whole. Our team has a few holes to patch up and our coaches as a whole can do better. The issues on our team have more to do with the coaching than they do the talent. What got us an 11-5 record last season was the fact that we are a fairly talented team. Yes there are some key areas that need to be fixed. You could say that about some other playoff teams. I wish we were more active in free agency but it appears Texans brass does not see the need. Perhaps they are right. Anyway if you had spoke of our teams special teams from before last season I could relate but last season our team improved quite a bit. maverick512000, CWTexansFan and Texansballer74 like this. Scorching hot: Something needs to change quickly. O'Brien is a mere 42-38 with just one playoff win in five seasons in Houston, and he's running out of excuses. Unlike in 2014, 2015 and 2016, he's got an excellent quarterback to work with. And unlike in 2017, his team wasn't ravaged by injuries in 2018. But it still essentially no-showed in a home playoff loss to the Indianapolis Colts. That probably can't happen again. It's time for the Texans to make a run in the wide-open AFC or find a new head coach to work with Deshaun Watson, DeAndre Hopkins and that talented young defense. ShinobiMusashi, FuzzyLogic, CWTexansFan and 2 others like this. It's all on me.....I'll take the blame for this loss. How many years do we have to put up with this loser? He is in the 1st year of a four year contract extension that runs through the 2022 season coming off an 11 win season. ObsiWan, CWTexansFan, JB and 1 other person like this.